Are you having fall weather where you are? We've had some gorgeous days lately. I see that next week the highs are in the 60s and I'm really looking forward to that! This Halloween card is a little on the large side - about 10 inches tall! I picked up a package of Halloween goodies at Michaels and this coffin was part of it. I decided to turn it into a card. I think I LOVE black glitter! It is just sooo pretty... Love this glittery black bat! I sewed a pocket on the inside so that two Halloween suckers could be popped in for a sweet treat. Now, let's talk desserts! I mentioned in my previous post that banana pudding might be my favorite dessert. Now, I 'm not talking anything that comes out of a box! 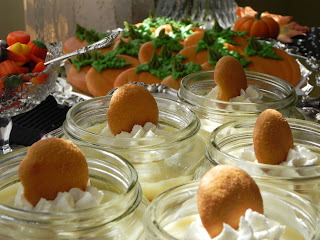 We made cute individual banana puddings in mason jars for my party a couple of weekends ago. Love how they looked! We also had perfect chocolate cake cupcakes filled with icing that looked like a candy corn. And, of course, we had our famous sugar cookies. When certain people RSVP the first thing they say is "Are you having your sugar cookies??" I think I would be in big trouble if I answered No! Mika and her husband were at my party taking pictures. She has a wonderful cooking blog and all of our delicious party recipes are posted today on her blog, Mika's Pantry. Be sure to check it out! Your card is great, first time I've seen this idea! Holy moly... that banana pudding looks sooooo good! I have to get right over to your friend's blog. Very nice! That glitter does give a friendly little jazz to the bat. Just saw your items @ Mika's Pantry, everything is just beautiful! I'm now following! Please stop by and say hello when you have a moment, I love company and new friends are always welcome! 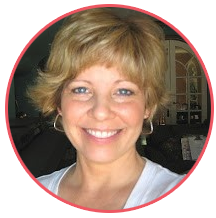 Lori, I just awarded you the Versatile Blogger Award! 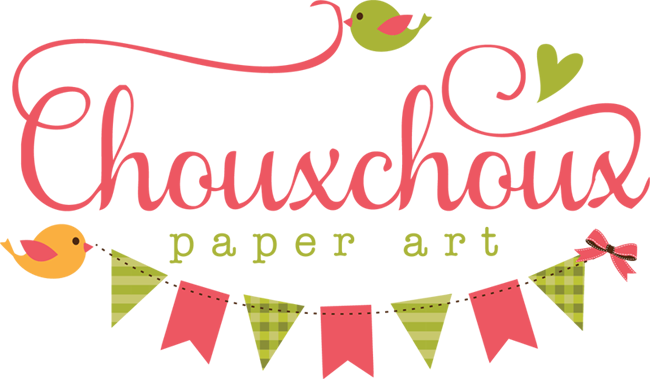 Stop by when you get the chance and check it out at http://igottacreate.blogspot.com/2011/10/bloggy-love.html. Have a great weekend! cute projects and yummy looking pudding! Your card look fabulous.. Who wouldn't love a sparkly bat.. I know I do.. It looks great. And your banana pudding look so yummy.. I like the black glitter too, it looks fantastic on the bats! Cute coffin card, well maybe not cute, but you know, nice! Love the card -- it's so creepy-cute! A fun card, great shape for Halloween - the banana puddings look scrumptious! We always have a great time at your parties! It's fun to post the pics......but mostly I love sharing all your wonderful recipes! Happy Halloween and a Fun Surprise!